Chelsea prevail in Prague in Europa League quarter-final first leg. 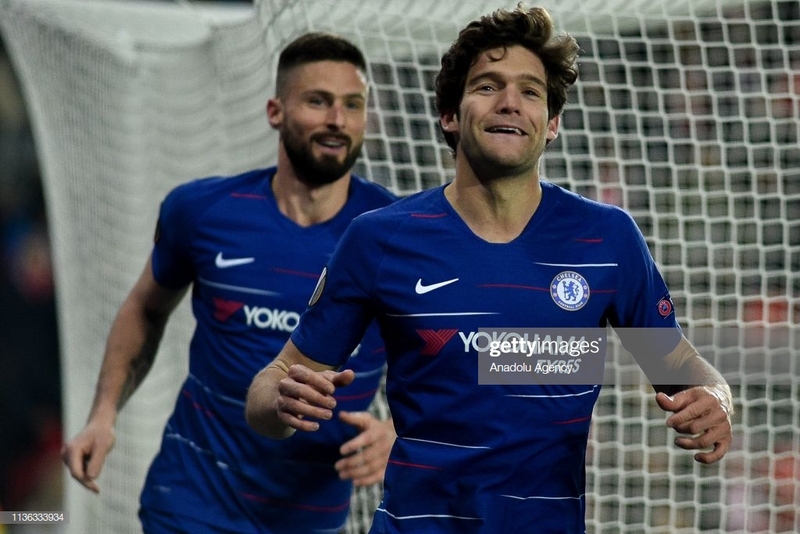 Chelsea took advantage in the first leg of their Europa League tie against a spirited Slavia Prague, scrapping a 1-0 victory, with Marcos Alonso the unlikely hero. Chelsea were unquestionably second best during the first half, the hosts looking hungrier than their opposition. Maurizio Sarri's side, usually so dominate in possession during the competition, could not find their passing rhythm, thanks to Prague's high press. Petr Sevick sent a stinging shot towards Kepa Arrizabalaga, warming the hands of the Chelsea 'keeper on a cold evening in the capital; a sign of how fired up the home team were in the tie. Against the run of play, the Blues formed their first real fluid attack, ending with Willian whacking the crossbar, following a fine curling effort from just outside the area. It was an almost identical start to the second period from that of the opening exchanges, Prague on top with Chelsea on the back foot. So much so, Sarri took extreme action by bringing on Eden Hazard before the hour mark, N'Golo Kante and Ruben Loftus-Cheek came shortly after. Hazard's presence alone lifted his teammates, as they fashioned two good chances in a matter of minutes. Antonio Rudiger lashed a fierce volley towards Ondrej Kolar in the Prague goal, who saved smartly with his legs. Willian then dragged his strike just wide of the post after a neat interchange with Olivier Giroud. Chelsea's changes did lift the Londoners, however, it did not halt Prague's persistent to go in front. From a Blues corner, 'Červenobílí' came charging downfield on the counter-attack. Ibrahim Traoré took the reigns, rifling a swerving shot from range that Kepa pushed clear of his net. The Spaniard was called into action again, making up for fumbling a cross by getting up smartly to deny the acrobatic volley from Jan Boril. The Czechs will have cursed themselves they didn't capitalise on a shaky Chelsea, who landed the sucker punch with five minutes to play. Willian's whipped cross located the head of Alonso, who headed home the crucial away goal; it was only Chelsea's second shot on target in the match. Far from convincing, Chelsea were clinical enough to edge past their plucky opponents, bringing back a slender lead to Stamford Bridge next week. Alonso returned to the starting line up after missing the match against West Ham on Monday, having overcome a hamstring injury. Unfortunately, it appeared the Spaniard had not fully recovered after a mixed evening in Prague. The left-back was hurried and hassled from the first whistle, losing the ball on numerous occasions under constant Prague pressure. He rarely forayed forward, a hallmark of his over the past few seasons, restricted to his defensive duties which he struggled with. However, just when Chelsea needed him most, the left-back delivered the killer blow by heading the only goal of the game, gifting Chelsea the lead across the two legs. Sarri now has a decision on his hands; stick with Alonso, who can produce moments of magnitude but has generally underperformed, or give the emerging Emerson a run at full-back. Seven points clear at the top of their domestic league, unbeaten in ten before tonight and having tasted defeat only twice in the Europa League this season, Prague had every right to be pumped up as they faced Chelsea. Overall, the Czechs will be kicking one another having taken nothing from a match were they were the better team. The energy of Jindřich Trpišovský's team was excellent, not wanting to give the Premier League giants a second to think. Chelsea rarely discovered a flow to their football, Prague demonstrating their toughest test during the tournament. They had their chances to take something to the Bridge, Kepa keeping out several good attempts from Prague, but it might be too little too late when they travel to Chelsea's fortress in seven days time.